Last night something special caught my eye in the seafood section of the grocers. Scrunched in-between several cod fillets and a heaping mound of sea scallops was a single cut of beautifully marbled blue marlin. Up until then the majority of the day I had been obsessing over the thought of doing some sort of fresh pasta since it’d been weeks since the last time I pulled out my mini roller and slapped some flour around the room. P.S. when I say ‘slap’ some flour around, I mean it. Unless you’ve been hiding under a rock for the past oh, I dunno, ten years, you’ve probably heard of a guy named Lebron James, and just maybe even of seen his pre tip off ritual where he claps a mound of white dust into the air and then blows it through his two fists. This is what I do before making pasta.. only I use all purpose flour instead of baby powder. I’m just kidding..
Anyways, since I had pasta on the brain, and Kristin all of a sudden wanted ice cream sundae’s- voicing her opinion literally seconds after watching me shell out another fifteen bucks a pound of someone else’s money [this post brought to you by the lovely Robert E. and Sandra M. Miesch] for some fish I hadn’t worked with before, but knew enough that it wouldn’t sit well on top the pasta- the only real way to make this thing work was if I served several dishes that night: an appi, main course, and maybe even a dessert. 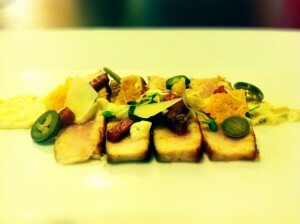 That is, depending on how things went [how much wine I drank while preparing the first two courses]. Normally three courses would be completely out of the question because my kitchen is about three feet wide and six feet long. So, anything more than a light sear, sauté, char [don’t you even think about mentioning the word “broil”], or two pots of simmering water on the stove at the same time automatically converts the attached dining room into a damp, fogged up pit of foul language and sweat-drenched under shirts. Neither of which my guests nor Kristin are very fond of. But after seeing that fish it didn’t take very much convincing myself that the majority of the prep work for two of the three dishes could be done quick and cold. So, I had to try and give it a go. Before leaving work the other day I picked up two bottles of sparkling which are new to the store: a Ca’ Vittoria Conegliano Valdobbiadene Prosecco Superior Brut and a Louis de Grenelle Rose Corail [100% Cabernet Franc]. Both non vintage and retail for under twenty dollars. Originally I’d planned on opening only one of them that night, depending on how the pasta would be sauced and what protein would be served with it. But now, obviously, I had to plan on opening both because there would be two dishes, and therefore there should be two wines, right? Fair is fair..
Blue marlin is a fish normally found in the warm, temperate waters of the Atlantic and it’s meat is often compared to that of tuna- high in protein and low in fat. So, I thought a crudo would play well here. Or, if Kristin refused to eat it raw, I could throw a light sear on it and still retain the majority of it’s fresh flavor and beautiful bluish hue. The Vittoria prosecco is a dry, very fruity, finely acidic bubbly which would be a fine match for an appetizer course- wonderfully simplistic and tart, allowing the freshness of both the wine and fish to compliment each other, while awakening the senses and not over saturating the pallet or badgering the mind with too much to think about. Refreshing and to the point. A great representation of what prosecco itself stands for. Seared blue marlin with sauteed pork belly, pickled jalapeno, crusted and shredded parmesan flakes, greens, sauced with a creamy-garlic aioli. Now, for the main event: the fresh pasta. I love making my own noodles. They cook significantly quicker than that boxed stuff, taste better, and are surprisingly easy to make. All you need [depending on the style of pasta to be made] is all-purpose flour, eggs and to expedite the process, a rolling machine. If you don’t have a machine, you can always go the traditional route and roll the dough out with a pin. Though this method is much more time consuming and isn’t always as consistent when it comes to producing cuts of like thickness and length- which not only looks awkward, but is something that can easily lead to parts of the dough over cooking and parts of it under cooking. I used three cups of flour and just about two and a half large eggs. After sifting the flour onto the counter top, I rounded it together into a mound, then made a well in its center and dropped in the eggs. With a fork I started to beat the eggs, slowly incorporating the two ingredients together until the egg soaked up all the flour that it needed. Then, dusted down a smooth surface, kneaded the dog lightly until brought together and set it aside for ten minutes under a wet rag to rest. While waiting for the dough to set I started on the sauce. The Louis de Grenelle is 100% Cabernet France, which means that this sparkler is significantly fuller in body compared to that of the prosecco. So, it could definitely hold up to a cream sauce thickened with a bit of semi-hard cheese, as well as a light to medium seafood protein. Which in this case was going to be cajun spiced jumbo shrimp. If you’re not sure where the tolerance level of your dining companions spice threshold sits, then pairing a spicy protein with a dense component like a cream sauce allows for the eater to gauge how he or she prefers the dish to be consumed. If the shrimp were too spicy, then he or she could incorporate more sauce to the bite. If they’re like Kristin and prefer to treat each single component as a dish on it’s own, then separate the shrimp from the pasta and see how the wine plays against either one. If you’re like me, then try all of these ideas and see which pair you prefer the most..
Fresh pasta in a white sauce with corn, snow peas, prosciutto, and parmesan crust. 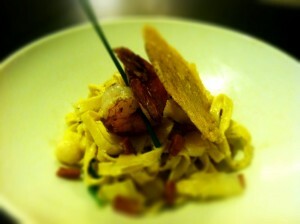 A bite of shrimp, a sip of wine; a sip of wine, a forkful of pasta.. a.. wait, the wine’s gone? Where’d all the food go?.. Ahh, man, I forgot to make dessert again, didn’t I? Well, it’s a good thing I can always count on my friend Don Julio to be there for me when I really need him, just a few shakes from the freezer. 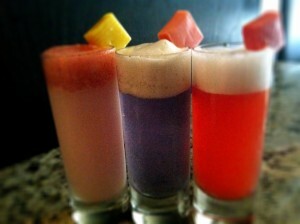 Taste the rainbow: peach- creme with raspberry foam, lillet- grape with pineapple foam, bing- cherry with lemon foam. 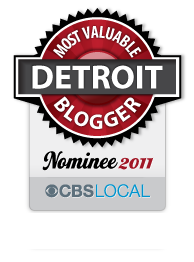 This entry was posted in Detroit, Food, Wine and tagged atlantic, bubbly, fish, Food, pasta, seafood, shrimp, tequila, wine. Bookmark the permalink.